For any special request, feel free to get in touch! For some folks your typical off the shelf AK isn’t enough. CWC provides a variety of options for those seeking custom builds and services. I’m always up for a challenge; contact me for more in-depth work request. Below is a just a quick over view of the more common work. Looking to build a beater or you’d prefer to refinish the gun yourself? 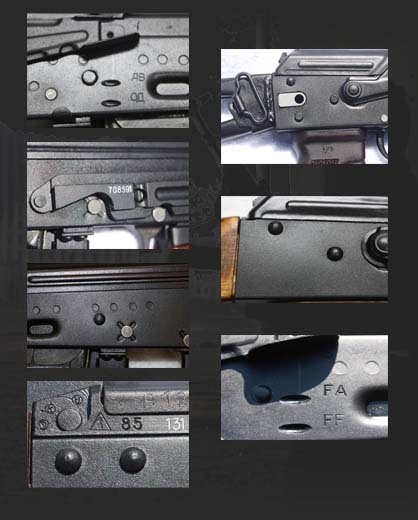 CWC offers a very basic build service in which we simply put the rifle together in working order and send it on its way. Additional work wanted will be charged accordingly. If it fits on my engraving machine I can engrave it… I’m offering Cyrillic selector markings in Russian and Bulgarian. Other countries include the Former Yugoslavia/Serb, East German, Romanian, Polish… Contact me on the possibilities. I’m able to replicate many arsenal markings like the famous Russian Izhmash Triangle/Arrow or the Molot Star/Shield… Numeral engravings as well. CWC offers a full blast/finishing service. I’ve been able to recreate a very durable and similar finish the Russians commonly put on their rifles. Pictures in the gallery should speak for themselves.